Thank you, Friends, for coming again to our weekly meeting to discuss the book, We Never Stop Being Parents. This week it is an honor and a great joy to introduce you to my friend Angel Warner. We met a few years ago when we left our sons in College, and we can honestly say that our sons have been blessed by this family. The Lord has given them grace to raise godly children and many of us are now enjoying the blessings of their hard labor. God is good! Our Dreams, Their Dreams, though unsure of the source, I have often heard it said that the most important decision after choosing to serve God with one’s life is the answer to the question: Alongside whom shall I serve Him? For parents, even of children who have been given grace to rightly choose God as their master, the potential answer to the second question can be the source of much concern, and rightly so. As married people themselves, parents know firsthand the pitfalls of being joined into one flesh with another sinner. Moreover, married couples are joined to new families who are likewise comprised of sinners. The potential for conflict and trouble grows exponentially, but so do the opportunities for all involved to grow in wisdom, maturity, humility and grace. In chapter nine, the authors do a wonderful job of demonstrating some of the ways in which parents can fall off the rails if they are not seeking to guide their adult children by biblical principles. Deferring to preference when our children are selecting life mates has the potential of doing serious and long-lasting damage to our relationships. But, as in all stages of parenting, we have God’s Word to guide us toward prudence. As has been pointed out in the other chapters we’ve read so far, our relationship with our adult children must shift from authority to counselor. The same holds true as our young adults select spouses. Because we want the best for our children, Christian parents begin praying early that God will be preparing godly spouses for them. As we pray, we naturally begin to envision the ideal characteristics we’d like to see in our future sons and daughters-in-law. There’s nothing wrong with that, of course. The problem comes when we create idols: phantom men and women who will be members of our particular church, children of our dearest friends, skilled and witty conversationalists, gifted musicians or artists, on it goes, even down to physical features. As the authors so wisely point out, the problem is that these are our daydreams, and our children have no biblical obligation to make our dreams come true. For parents to try to impose such an obligation where none exists is to usurp the authority that belongs to the Lord as the sovereign over our lives and those of our children. In some Christian circles, fathers have been taught that they are the supreme authority even over their children’s marital choices. It is true that, for a season and to illustrate heavenly realities, fathers act as prophets, priests, and kings in their homes. However, this temporary authority is designed to help fathers point their children to the Lord who is the true Sovereign. Fathers who can see themselves and this temporary authority rightly should delight in relinquishing their adult sons and daughters into the care of a King whose judgments, mercy, and leading are without error. Thereafter, parents must trust their children and all their decisions into His care. 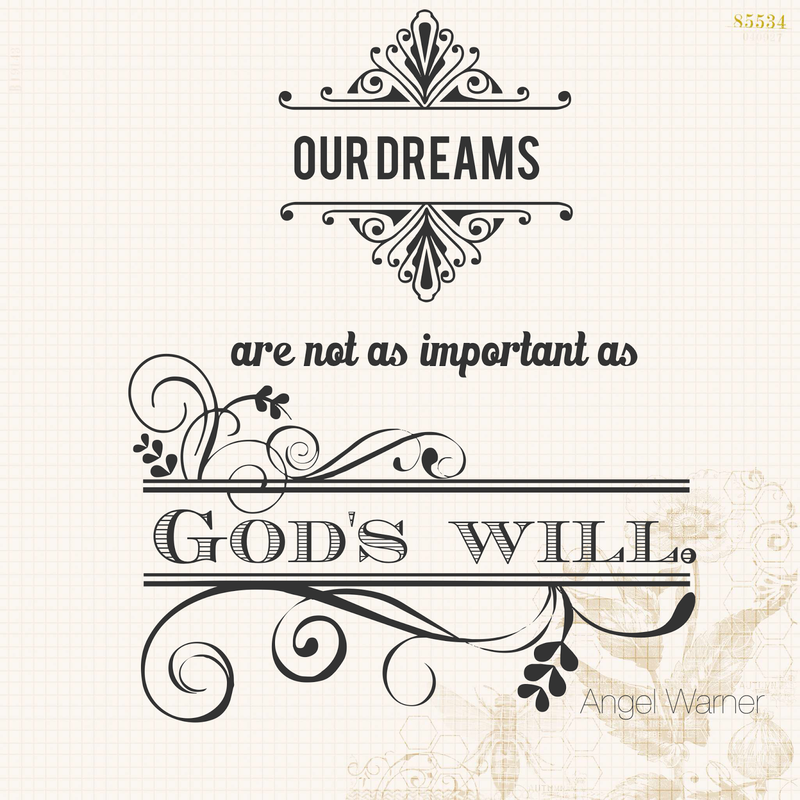 Our dreams are not as important as God’s will. We have been through this process four times now, and I can say without reservation that it can be challenging. We have one son-in-law, two daughters-in-law, and one daughter-in-law to be. We dearly love each one of them, but we have had to confront our pre-conceived notions each time. I have to admit that this was most pronounced with our daughter, not because of her choice, but simply because she was a daughter. We had taught her (and all her brothers) the principles of biblical roles in marriage and male headship. It is one emotional milestone to marry off a son; it is quite another to walk one’s baby girl down the aisle and place her into the care of another man who will become her head. My husband and I found that it required us to exercise a new level of trust in the Lord’s care for our daughter. In contrast, when sons marry, there is something very humbling about watching the father of a young woman walk down the aisle and place his baby girl into the care of your son. This has been a summons for us to pray fervently that our sons will be godly, merciful, tender, strong, and faithful servant-leaders who will love these women who have been entrusted to them. In either circumstance, trusting God to lead our adult children in our stead is both freeing and sanctifying. Our children are called to their own journeys and their own struggles. They may choose spouses who surprise us. They may handle their trials in ways that we would not. Yet, if we truly believe that God is sovereign, we can trust that God is using these things to mature them in grace. We have seen this at work in the lives of our married children and have been amazed at the refinement that is being produced through trial. Likewise, we can see how God has used our relationships with our married children and their spouses to refine our own growth in grace. Of course, there is a distinction between loving a sinner and enabling sin. True love does not make provision for the practice of sin. I believe this makes the author’s point above more poignant. It’s a fine line to walk, but when we are warm and loving, our children are more likely to be understanding of our refusal to facilitate immorality. Here again, obedience to the biblical principles, in this case exercising love and upholding righteousness, may not be easy, but God plainly tells us that He will bless faithfulness to His commands. Thus we have another opportunity to take Him at His word and show our children that our faith is genuine. Finally, after reading this chapter, I found myself reflecting on two underlying theological aspects of the larger discussion. The first is indicated in the initial illustration about the father who refused to embrace his daughter’s romantic choice simply because the young man held doctrinal positions that were different than his own. While his reaction was extreme, if most of us were honest, we’d probably have to admit to this same type of bias in our own hearts. Of course, we would prefer that our children marry people who embrace our theological leanings. It certainly would make for fewer potential landmines in table conversations. Yet, to look askance at someone who does not is evidence that we are not discerning the body of Christ as we should. His church is much larger than our particular segment of the Christian faith, and we should embrace opportunities to exercise grace toward our Christian brothers and sisters. How much more so when they are part of our own families? The other theological principle is that of generational faithfulness. If we truly believe that we and our descendants are in a covenant relationship with God, then we ought to be thinking in terms of how we are part of God’s plan to pass on the truths of the covenant to future generations. There is simply no way we can be part of this plan if we jeopardize our influence by ungracious behavior toward the parents of our grandchildren. Any hard-heartedness on our part will prohibit our witness. We must earn the right to be heard; we must demonstrate that we can be trusted; we must humble ourselves taking on the attitude of servant-hood to our adult children, loving them and showing them respect. Only then can our message convey a sincere love for our Lord and His covenant. May our Lord help us to live with grace as we seek to be a blessing to the next generation. Angel Warner is married to her best friend, David. They are parents of eleven (7 by birth, three by marriage, and one by engagement). Their greatest earthly delight is their family, which now also includes a grand-daughter, their first grandchild. More than anything, Angel lives in wonder and gratitude for the continual faithfulness, love, and mercy of the Father. She, her husband, and youngest daughter live in beautiful Geneva, Illinois, and are in the process of restoring a 1927 home—their third historic restoration project.